Had a chat with Glen Ridge on Melbourne Tonight (Radio MTR) this evening in the wake of a Herald Sun report that only one in three Gen Ys and about half Gen Xs will bother sending physical xmas cards this season. 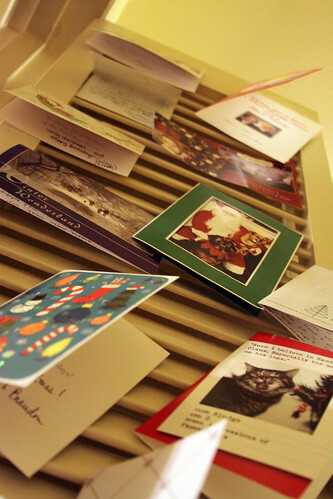 The theory is that social networks will carry the cheer and this will be good news to the planet because back in 2005, xmas cards purchased and sent by people in just the USA and UK would have stretched around the world 54 times! This is made worse by the fact that much new tree material, inks and plastics are consumed by the industry. While there will still be some people who feel slighted if friends sent electronic messages, I think that feeling will pass as long as the e-greetings convey the warmth and generosity of spirit that we attribute to handwritten missives. Of course, there will still be loads of thoughtless, banal, carbon copy physical cards and e-cards sent this year – at least the thought will count for both of them, even though Mother Earth would probably prefer the latter! If you weren’t in Melbourne tonight, here is the chat. Oh, and Merry Christmas, or Happy Holiday, or whatever greeting you might prefer.